Last year (I think) someone posted a doily that Laura Ingalls Wilder had done and instructions on it. Does anyone remember this or know of this? I would like to see it again and read the instructions to see if it's difficult to make. I think this is what you're looking for -- http://pages.prodigy.net/john.simpson/Laura%20Ingalls%20Wilder%20Filet.jpg. My mom is an avid crocheter, and she subscribes to several crochet mailing lists. Somebody on one of the lists had posted this, and I uploaded it to my web site. Yep! I believe that's it. WOO! A friend of mine just shared this with me...I had never been able to get a good working pattern to be able to make this doily...but I think this one might work! I thought I'd share it here in case anyone else is interested. I'm hoping to give this a try! Not right NOW because I'm working on a surprise for a friend for her birthday in April...but once I finish that, and some baby booties for two friends who are expecting, I may be able to give it a go! additional mesh to be added. DEC AT END OF ROW = leave remainder of row unworked, turn. right. Work odd numbered rows from right to left. 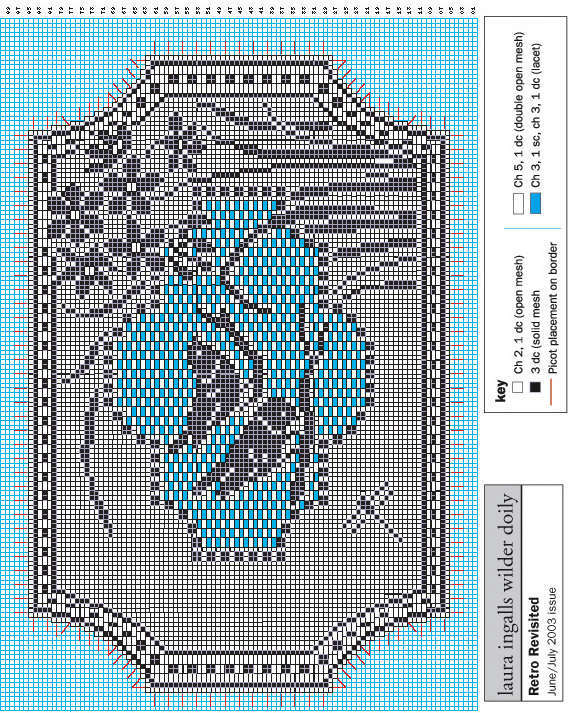 same time, work picots as indicated on pattern. Fasten off. I bet that would be so pretty! Post a picture before you send it off ! Wow, that looks like it would be nice! If you get to try it, I want to see a picture!